FORT WORTH, Texas (December 13, 2017) – The Fort Worth aviation community is once again aiming high to help make the holidays brighter for area children. Hosted by American Aero FTW, a private aviation terminal at Meacham International Airport, the fifth annual toy drive and luncheon collected more than 200 toys and 65 bicycles this year, thanks to American Aero FTW employees and clients, airport tenants, and area firefighters and police officers who attended the festivity and brought donations. Each year, Toys for Tots requests new, unwrapped toys to distribute as Christmas gifts to less fortunate children in the community. 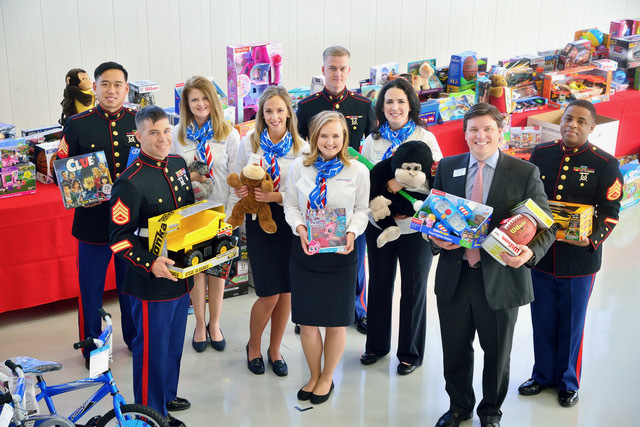 Since opening its doors in 2013, American Aero FTW has helped collect more than 1,000 toys and nearly 500 bicycles on behalf of the U.S. Marine Corps Reserve Toys for Tots Program. American Aero FTW played a leading role in recent renovations at Meacham, and recently unveiled a new facility in the airport’s recently renovated terminal building. In addition to the Toys for Tots program, the FBO matches customer donations to make an annual contribution to the Navy SEAL Foundation. In 2017, a donation of $22,000 was earmarked to support scholarships for former SEALs interested in earning a pilot certification. Members of the U.S Marine Corps Reserve and staff members of American Aero FTW proudly show off the hundreds of toys and bicycles collected today for the U.S. Marine Corps Reserve Toys for Tots program. American Aero FTW conducted its fifth annual toy drive and luncheon for employees and clients, airport tenants, and area firefighters and police officers who brought donations. Second from right is Riggs Brown, American Aero FTW general manager. The mission of the U. S. Marine Corps Reserve Toys for Tots Program is to collect new, unwrapped toys during October, November, and December, and distribute those toys as Christmas gifts to less fortunate children in the community in which the campaign is conducted. Visit Toys for Tots Online.